The Philips electronic giant was established in Eindhoven in the 1890s and immediately started to transform this once small Dutch village. Although much of Philips has now relocated to Amsterdam, the remnants of Eindhoven's important industrial past remains clearly present. 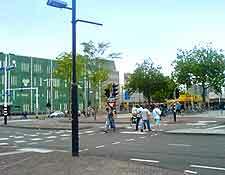 Eindhoven is a large and spreading city, with many merits and unique qualities. 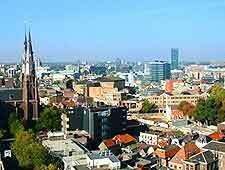 The city is perhaps most famous for its football team, the PSV, who regularly star in the National League and sell-out matches to crowds of more than 30,000 people. For tourism advice, the bright blue and white Eindhoven Tourist Information Office is easy to find and located on the Stationsplein, directly outside of the railway station. 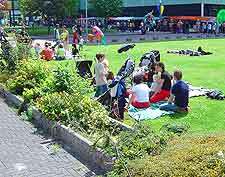 There are a number of quality tourist attractions around Eindhoven, with a number of the most popular being located within the Genneper Park. These include a working water-powered flour mill, waterfront cycle trails, and the exceptional De Tongelreep Swimming Paradise, where fast water slides, rapids and wave machines await. Whatever the time of the year, ice skating is always popular in Eindhoven at the Ice Sports Centre, while the regular concerts at the Frits Philips Concert Hall may also be of interest to many visitors, along with various events at the iconic flying-saucer shaped Evoluon. 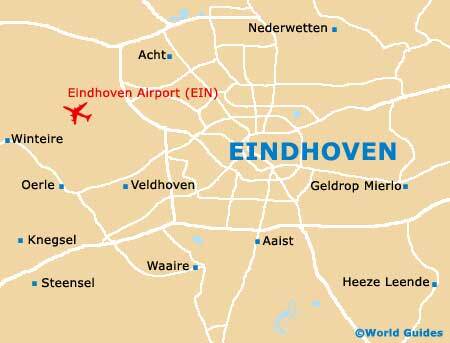 More information about Eindhoven Tourist Attractions and Landmarks. Without doubt, the Stedelijik Van Abbemuseum is amongst the main cultural sights in Eindhoven and contains a truly wonderful collection of modern 20th-century paintings, with creations by artists such as Chagall, Kandinsky and Picasso. Also of note in Eindhoven are both the Philips First Incandescent Lamp Factory and the Historical Open Air Museum, where an Iron-Age village is recreated, with springtime Viking markets and other seasonal activities being particular highlights, especially when the Romans arrive! 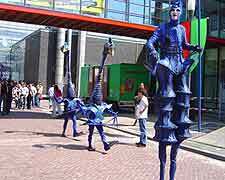 More information about Eindhoven Museums and Art Galleries. Outside of Eindhoven are many appealing Dutch cities and towns worth enjoying at your leisure, if you have the time. Even the capital city of Amsterdam is close enough for a day trip, as is Rotterdam, Den Haag and the city of Antwerp, across the border in nearby Belgium. Next to the town of Tilburg, tourists in Eindhoven regularly spend time viewing the exotic creatures at the Beekse Bergen Safari Park, or exploring the historic castle and medieval church is Breda. More information about Eindhoven Attractions Nearby.